The sun had just finished setting by the time they stopped again. This time, they were in front of a smart looking if small house, resembling nothing more than Maryam’s cottage in four-fifth’s scale. When juxtaposed with the house they’d left behind, this house looked positively tiny. Three boys dressed almost identically to each other were doing things outside the house: one was chopping wood, another sweeping the porch, and a third cleaning the windows. As the sleigh came to a stop at the end of their sidewalk, the three waved in unison to Maryam, who returned the wave. They then fell into a marching formation and went into the house, single file. The evening was getting colder by the moment, so Bree and Fin took the stop as an opportunity to stretch their legs and warm up a bit. The driver’s bench was perfectly comfortable, but sitting for too long made Fin fidgety. As they stood stamping their feet and blowing into their hands, the three boys appeared from the side of the house, carrying yet another large bag above their collective heads. Fin took one look at it, then said, “Let me guess: it’ll fit, no problem.” Maryam’s only reply was a quick wink. Bree and Fin helped the three boys push the bag into the back of the sleigh, as the boys could barely see over the edge. Maryam had wandered into the house’s front yard, and the boys joined her there as soon as the bag was in the sleigh. 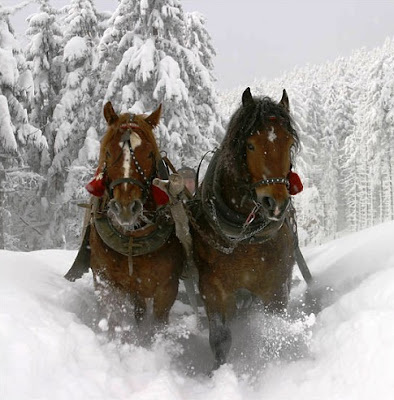 Bree and Fin were about to join them when Maryam turned abruptly toward them and hurried back to the sleigh. Bree and Fin got back onto the driver’s bench as fast as they could while Maryam went to check on the horse’s harness. She took a moment to whisper to the horses and stroke their manes and necks, then dashed around the side and onto the bench herself. The horses were off before she could even grab the reigns. They immediately accelerated to what Fin considered an unsafe pace, then poured on more speed. It was dark and no one was holding the reigns. Fin was beginning to actually feel a little scared when Maryam reached behind Bree’s back to touch his shoulder. “Everything is still fine, Fin. We just need to get back to the cottage.” Maryam’s hand was warm and comforting, and her eyes seemed to twinkle a bit in the twilight. Fin calmed down a little as Maryam finally grabbed the reigns and handed them to Bree. With that, Maryam vaulted over the back of the bench and into the sleigh bed. She opened all three bags and began rummaging through each, occasionally moving something from one to another or shifting items around within each. It was snowing again, more heavily this time than earlier in the day. The darkness deepened as they raced along the landscape. The scenery seemed blurry to Fin, as if they moved too quickly for his eyes to focus on any particular thing. Bree stared steadily forward, a determined smile on her face. Steam rose from the horses in steady streams. The bells on the sleigh rang in a hurriedly jolly manner, their din louder than it should have been at that speed. In what seemed to be only a few minutes, they were pulling onto the open fields where they had first entered the woods. The horses continued their frenetic pace until they came to a stop in the field adjacent to the cottage. Fin had already climbed down and helped Bree out of the seat. They stood back and watched the sleigh streak off again, picking up more and more speed until it seemed to fade from view. Even then, they thought they could still hear the sleigh bells jingling merrily, but eventually that, too, faded. They made their way back inside the house and found everything as Maryam had described — a romantic, candlelit dinner for two was laid out for them. The lights in the house were low as well, just light enough to see the way through. When they took their seats, the lights seemed to dim of their own accord, so that only the candles and firelight illuminated the couple. “This has been… odd,” began Fin, taking a sip of his wine. Bree put her glass down, walked around the table, and pulled Fin out of his chair by the hand. She put his arms around her, then her arms around him, and leaned into him, swaying slowly back and forth.